Erika helps organizations improve their image and business identity, from logo and web design to strategies for advertising campaigns on the Internet. Erika keeps current on all technologies and software in the Graphic Design field and dedicates 100% of her creativity to every project, allowing her to deliver quality results for all of ER GRAPHIC SOLUTION’s clients. 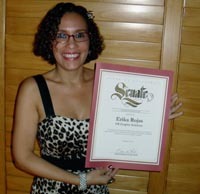 In December 2012, Erika received a recognition from the California Senate for her support to MACH, a non-profit organization that helps small businesses.